Managing your allergies is an important part of staying healthy. Your doctor will help you find out what may be causing the allergies. 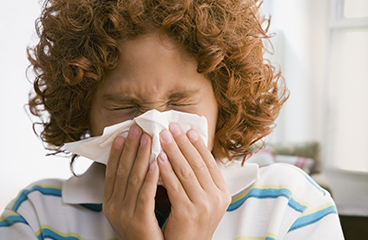 Common causes of allergy symptoms are house dust and dust mites, animal dander, mould, and pollen. As soon as you know what triggers your symptoms, try to reduce your exposure to your triggers. This can help prevent allergy symptoms, asthma, and other health problems. Wash sheets, pillowcases, and other bedding every week in hot water. Use airtight, dust-proof covers for pillows, duvets, and mattresses. Avoid plastic covers, because they tend to tear quickly and do not "breathe." Wash according to the instructions. Remove extra blankets and pillows that you don't need. Don't use home humidifiers. They can help mites live longer. Use air-conditioning. Change or clean all filters every month. Keep windows closed. Use high-efficiency air filters. Don't use window or attic fans, which draw dust into the air. If you're allergic to pet dander, keep pets outside or, at the very least, out of your bedroom. Old carpet and cloth-covered furniture can hold a lot of animal dander. You may need to replace them. Look for signs of cockroaches. Use cockroach baits to get rid of them. Then clean your home well. If you're allergic to mould, don't keep indoor plants, because moulds can grow in soil. Get rid of furniture, rugs, and drapes that smell musty. Check for mould in the washroom. If you're allergic to pollen, stay inside when pollen counts are high. Don't smoke or let anyone else smoke in your house. Don't use fireplaces or wood-burning stoves. Avoid paint fumes, perfumes, and other strong odours. Enter L249 in the search box to learn more about "Managing Your Allergies: Care Instructions".